I want you to know how grateful I am for your loving care, expressed to me during my sad loss. Led by Sherri Goldstein, LCSW, Bereavement Coordinator with Penn Medicine Princeton HomeCare and a chaplain, this group welcomes community members who need support and assistance in coping with grief and loss. This group usually meets on the third Monday of the month. No fee. Call Sherri Goldstein at 609.819.1226 to attend. Spouses and friends share the joys and challenges of caregiving; whether at home, at a distance or in a care facility, for any diagnosis. Professionally facilitated peer support for adult children caring for aging parents. Parents may be living independently, living with you, or in a residential care community, near or far, at any stage in the aging journey. Socializing over personal craft projects. Conversation about the joys and challenges of grandparenting with Lenore Sylvan. Friendly conversation provides the backdrop to the clacking of knitting needles. Start a new knitting project or bring an old one to finish. All knitting levels welcome. 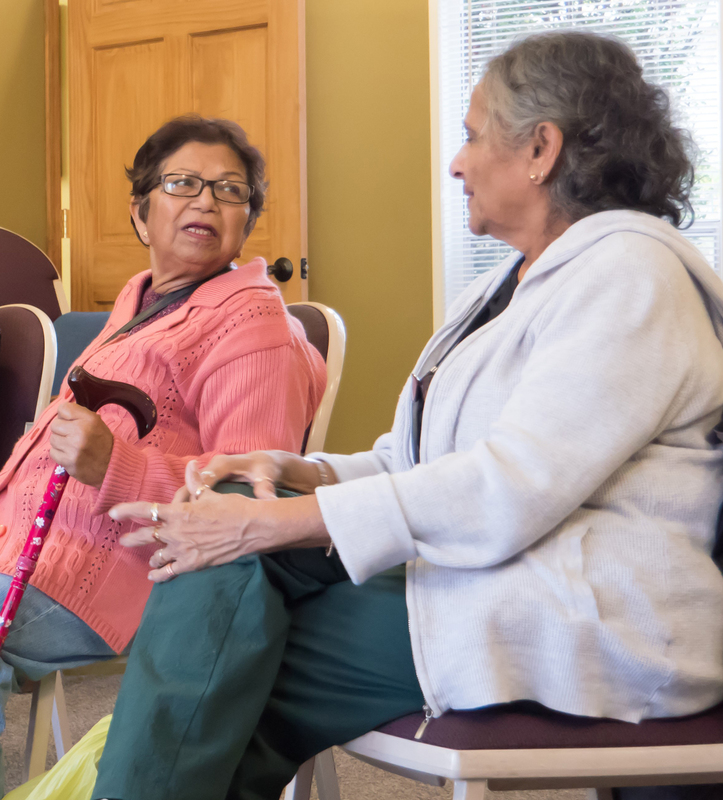 Conversation and culture for adults over 55 who are not native English speakers. All languages welcome. Share support, resources, relaxation, laughter and stories as well as light refreshments. Come and meet others who are making or have made the transition into retirement. For information call 609.924.7108. Group is facilitated by Barry Chalofsky, Rob Hegstrom, and Bruce Wallman. For men and women that have moved through the early stages of grief, after losing a spouse, and are starting to feel ready to engage with people and activities. First we watch a fascinating TEd Talk, then we discuss it. Discussions facilitated by Helen Burton. This monthly group deals with issues related to making the adjustment to retirement. All are welcome. Facilitated by John George, PhD, licensed psychologist, and Dave Roussell, MSEd, MSW, LSW, PSRC Care Coordinator and HomeFriends Coordinator. Meet interesting people, make new friendships, enjoy conversation, share experiences and join in engaging activities that stimulate personal growth. This group is facilitated by Cheri Chalofsky, Joan Fredericks, and Dina Kravets. Many other social activities are planned throughout the year, including trips, movies, meals, lectures and more. Check the Special Events section of the website for details.